Transparency Market Research, in its latest report, indicates that the growing use of global inorganic metal finishing market components in several automotive applications is estimated to propel the global market. The report is titled “Inorganic Metal Finishing Market - Global Industry Analysis, Size, Share, Growth, Trends and Forecast 2014 - 2020”. In 2013, the worldwide market for inorganic metal finishing was pegged at US$54.7 Bn, which is forecast to rise to US$83.3 Bn by 2020, registering a healthy CAGR of 6.20% from 2014 to 2020. According to the report, the market is fueled by a thriving automotive industry, growth in the steel industry, and introduction of new environment-friendly technologies. However, strict environmental policies are projected to hamper the development of the inorganic metal finishing market. Regulatory bodies such as REACH and EPA have laid down stringent laws pertaining to chromium emissions during several metal finishing processes and this is anticipated to challenge the growth of the market. The research report studies the overall market by segmenting it on the basis of product type, application, and geography. The key product segments of the inorganic metal finishing market include consumables and spares, inorganic metal finishing processes, and pretreatment/ surface preparation. Inorganic metal finishing finds application in electrical and electronics, automotive, industrial, and others such as defense and hardware. Accounting for a share of more than 50.0% in terms of revenue in 2013, the automotive sector has emerged as the dominant application segment of the inorganic metal finishing. Industrial followed next, with electrical and electronics and the others segment following the suit. Geographically, the global inorganic metal finishing market is divided into North America, Asia Pacific, Europe, and Rest of the World. Among these, Asia Pacific dominates the overall market and in 2013, this region accounted for 35% of the market. Asia Pacific is a key destination for producers of inorganic metal finishing and this region is primarily fueled by expansions in the steel, automotive, and electrical and electronics markets. Driven by economic development and rise in disposable income, Asia Pacific is projected to also become the most rapidly developing regional market for inorganic metal finishing. 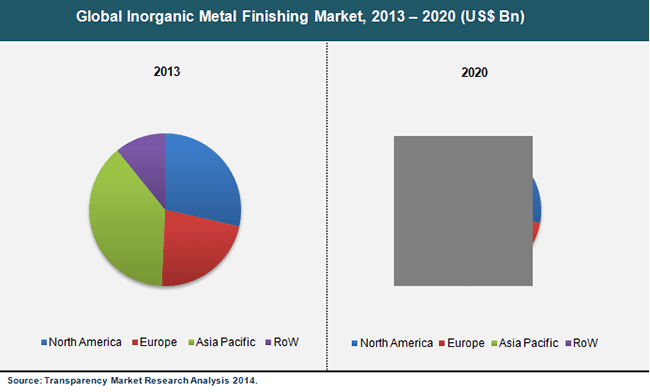 North America has emerged as a strong contender in the global market and this region is anticipated to register a 5.90% CAGR from 2014 to 2020.The research report identifies and profiles the major companies competing in the global inorganic metal finishing market. These include Sequa Corporation, Vanchem Performance Chemicals, Honeywell International Inc., Atotech Deutschland GmbH, TIB Chemicals AG, Metal Finishing Technologies LLC, Abakan Inc., Industrial Metal Finishing, Rockwood Holdings Inc., and Elementis plc. Each of these players is reviewed based on attributes such as company and financial overview, product portfolio, recent developments, and business strategies.